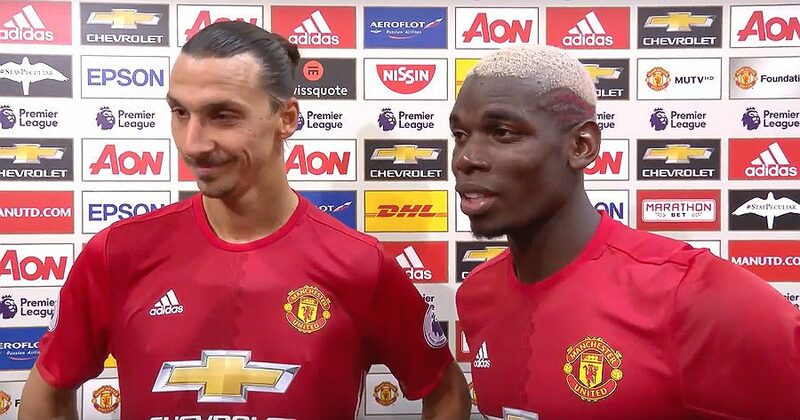 MANCHESTER, Sporting Alert – Manchester United forward Zlatan Ibrahimovic jokingly told his agent he would “break his legs” if he allowed Paul Pogba to move anywhere but Old Trafford during the past transfer window. Both Ibrahimovic and Pogba share the same agent, Mino Raiola, who also represents Henrikh Mkhitaryan, who made the switch to the English Premier League giants this summer as well. The former PSG striker linked up with Jose Mourinho on a free transfer, which was straight forward, after the French champions opted not to offer the Sweden star an extended contract. However, it took a world record fee and some time for the deal for Pobga to go through, after Juventus, Manchester United and Raiola were in a three-way battle over which party would be responsible for paying the player’s representative. It was understood that Spanish giants Barcelona and Real Madrid were also very interested in signing the Frenchman, so Ibrahimovic made it his own duty to give Raiola a little shove to speed up the process in ensuring the midfielder followed him to the same English Premier League club. “Zlatan told me, ‘Do not transfer Pogba elsewhere or I will break your legs,” Raiola told Volkskrant.nl. The two world-class players have shown flashes of what could be a very deadly combination in the future, but Raiola admits that Pobga is still searching to find his best role in Mourinho’s starting team. The 23-year-old scored his first goal for Manchester United in a dominating 4-1 victory over Leicester City on Saturday and was heavily praised for his much-improved performance. But many, including Raiola, believe Pobga is not being played in his right position under Mourinho, which he indicated was on the left-hand side as an attacking midfielder. “Pogba still has to find his place in the team,” noted Raiola. Saturday’s victory snapped a run of back-to-back defeats in the English Premier League and that win, along with the EFL Cup victory at Northampton during the week, which ended a run of three successive defeats in all competitions, will give the Red Devils much-needed confidence heading into European football again. Next up for Manchester United is a clash with Zorya Luhansk in the Europa League, before facing Stoke City in the Premier League.